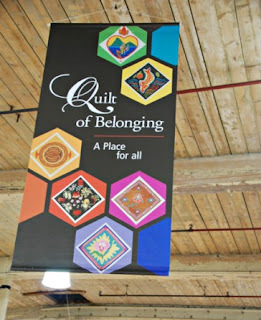 Recently, I went to the Cotton Factory in Hamilton to walk by the 'Quilt of Belonging'. It was my third visit, and each time I walked up and down many times and each time I saw something new. This final time I took some pictures. 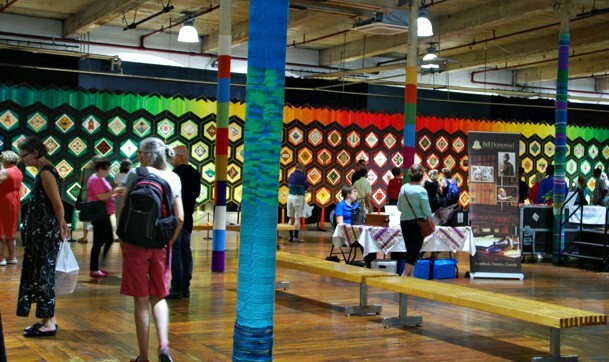 There are 263 quilt blocks, all made by volunteers. Each one celebrates the cultural background of 70 First Nations and 193 nations around the world from whence people have settled in Canada. It has been on tour for 12 years. And, as you can imagine, it is HUGE! 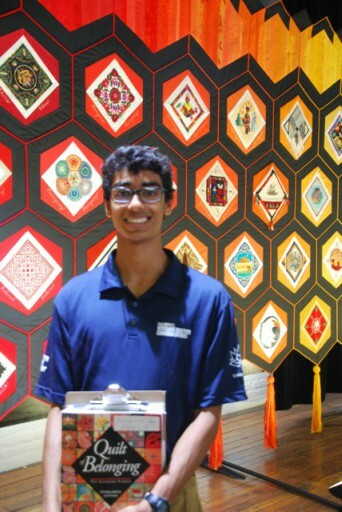 Pradesh had the coolest summer intern job. After 5 weeks answering questions and offering information (and helping people find requested countries) he knows more about textiles and geography than he ever thought possible. 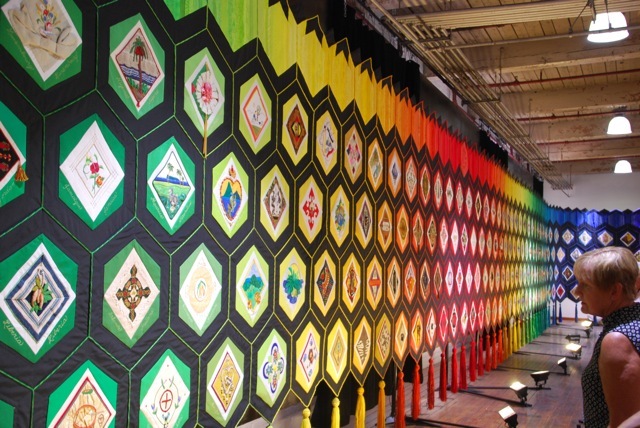 I bought the book, but you can also click on the Quilt of Belonging link and see each of the quilt blocks and learn about the design and the country. 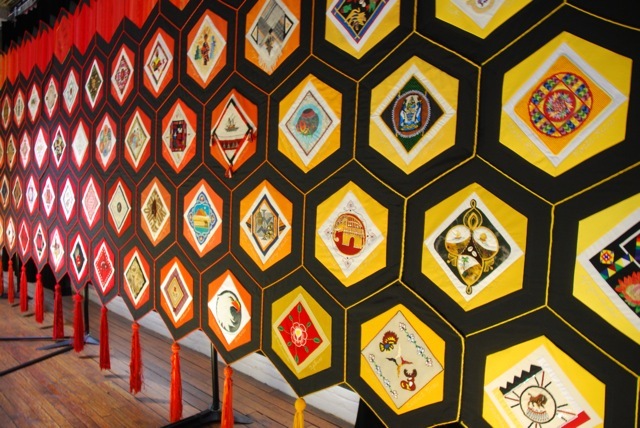 It was nice to have the quilt just there, without the encumbrance of descriptions, but those descriptions from the book helped in understanding the designs which were sometimes not that obvious. 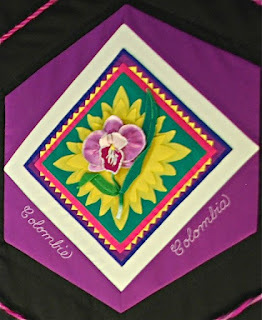 Appliquéd work is often used to illustrate scenes or elements of everyday life in Colombia. The block, designed by Aida Ramirez Mesa and stitched by Jeannette Schaak features the country’s national flower, the Cattleya orchid. It is reproduced, in varying shades of pink and violet silk, using both the three-dimensional and flat versions of this technique. Colombia produces and exports a variety of flowers, including thousands of species of orchids. Yellow petals surrounding the orchid are symbolic of the plentiful sunshine found in Colombia. The background of this piece is made using the mola technique. 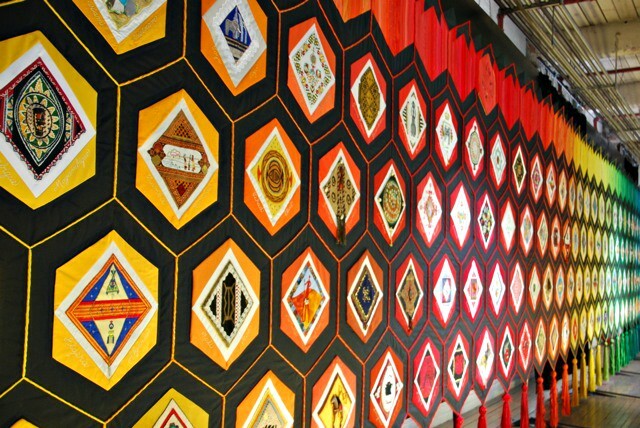 This unique, reverse-appliqué style of needlework, traditionally done by Kuna Indians, involves several layers of differently coloured cotton. Fabric is cut away and the edges turned under and stitched to expose the lower layer of material. This piece includes a saw-tooth edged layer of yellow, as well as a layer of green (for the mountains), pink and violet (for the abundance of flowers), and blue (for the ocean). Australia is home to over twenty-thousand varieties of flora; of which this block features but eleven of the unusual wildflowers, exquisitely stitched by Lyn Prichard. Australians rarely pick wildflowers for display, preferring them in their natural setting. The informal design also reflects the Aborigine design style often seen in their dot paintings. Clockwise from the 12 o’clock position, the flowers are: Sturt’s Desert Pea, Wattle, Kangaroo Paw, Banksia and Dryandra, Waratah, Tasmanian Blue Gum, Grevillea, Callistemon or Bottle Brush, and Geraldton Wax Flower, with Christmas Bells and Cooktown Orchids filling the centre. To maintain a ‘controlled profusion’ of stitches in her embroidery, Lyn Prichard used Australia’s prevalent styles of needlework. She incorporated stem stitch, the lazy-daisy stitch, chain stitch, bullion stitch and a rich selection of other stitches and embellished the work with delicate French knots. 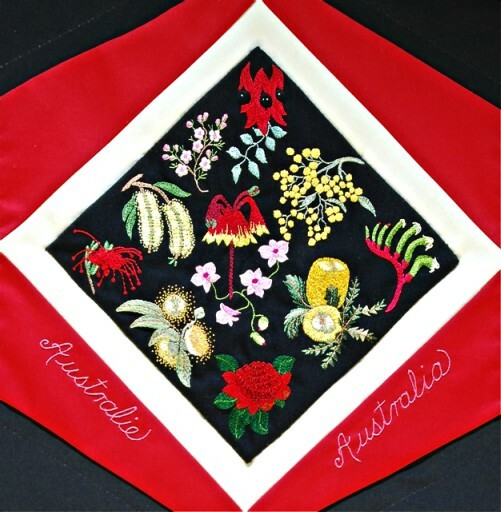 The black wool background was used to contrast with the vivid colours of the flowers and is a fitting choice as Australia is the world’s chief wool-producing country. 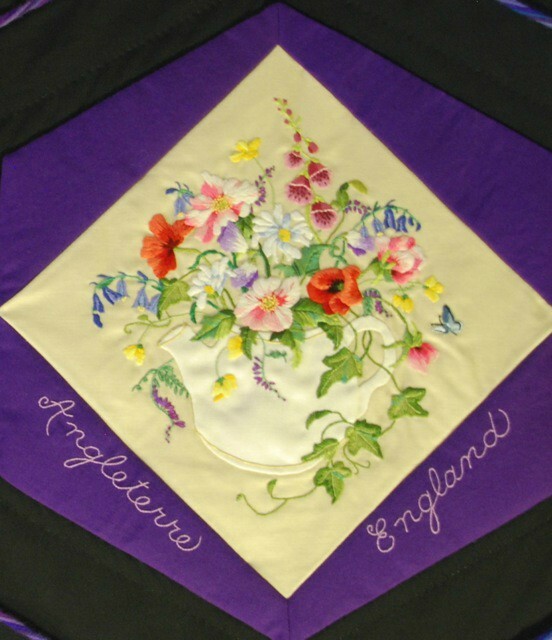 On a background of English linen, Sally Blacker embroidered a colourful display of flowers found both wild in the fields and in traditional English cottage gardens which spills informally out of an appliquéd, gold-edged teapot. In customary English floral embroidery a bug is always hidden, hence the flickering blue butterfly hovering nearby. Bluebells, foxgloves, buttercups, wild roses, vetch and daisies are beautifully embroidered in varying shades of red, pink, purple, blue and yellow and are connected by cascading leaves in changing tones of green. English ivy, evoking memories of cottages, churches and schools delicately winds around the teapot’s handle to complete this image reminiscent of the English countryside. This complex, three-dimensional voyageur canoe, filled with trading goods, is the work of Reverend Kathryn Gorman-Lovelady, an Elder of the Métis Council. It pays tribute to well over 300,000 Métis across Canada. 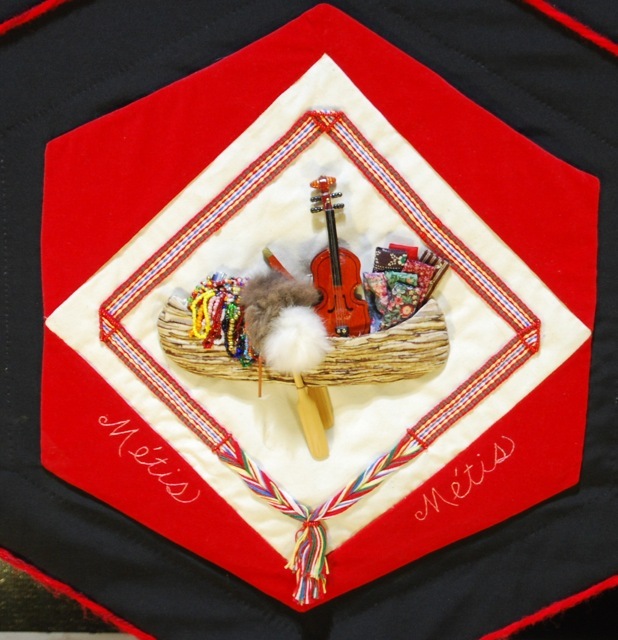 The muslin-backed block is a blend of textures, talents and skills, like the Métis themselves. Wooden paddles, hand-carved by Robert Newell, accompany the canoe (representing the coureurs de bois), which is made of quilted, birchbark-patterned fabric imported from England. It is laden with traditional trading goods: barrels of colourful beads, fur pelts and bolts of cloth. The hand-made, miniature strung fiddle reflects the Métis’ love of music and proficiency as fiddle players. Framing the vignette, a miniature, multi-coloured sash, woven by Daphne Howells, incorporates blue for the Hudson Bay Métis and red for the Red River Métis. How absolutely gorgeous! I would love to see that. 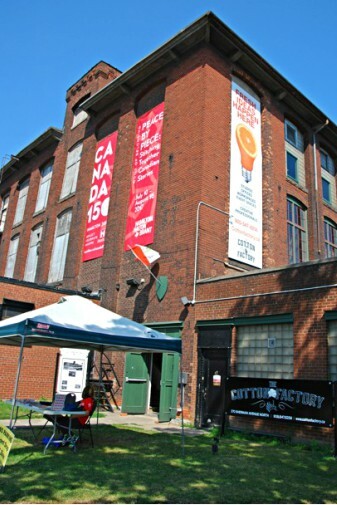 I was so glad it was free (in Hamilton - not in Toronto, though!) so that I could go back as often as I wished. ...a place for all, what a wonderful idea, perhaps we should try this! this took six years to organize - i can only imagine the headaches (and joys) of that process! Heavens to Betsy, it's huge! Thank you very much- my quilt lovers will enjoy this :) :) Me too! Have a happy week! It does take your breath away! Wow, what an incredible exhibit and lots of work. I plan on watching the doc they have on youtube. Thanks for sharing! that is also a good link to view. thanks. 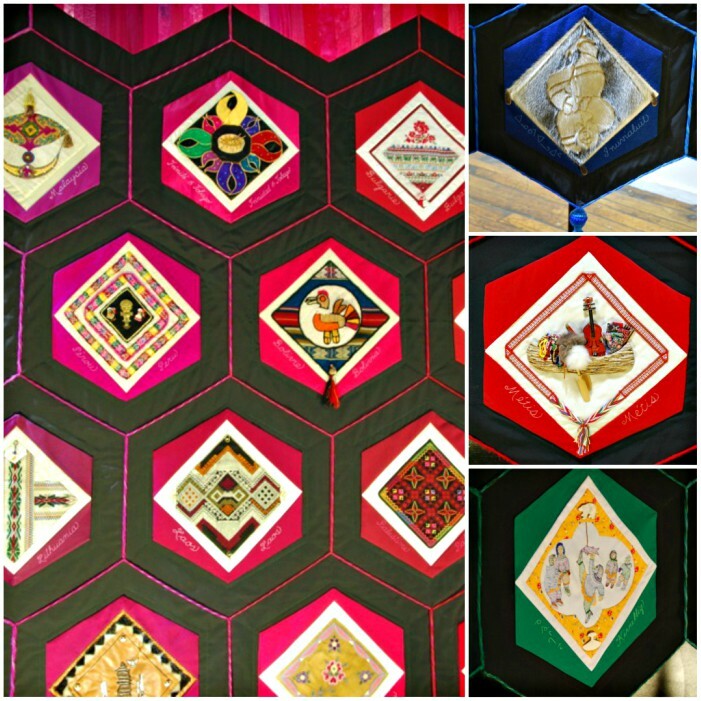 Fascinating Quilt! My country (Israel) is also made up of immigrants from all over the world. Canada has a great advantage - its vastness. We have a tiny country, and the closeness brings up the conflicts among the variety of people, leaving little hope for a good future. Yes ... though most of the population is concentrated in a relatively small area for all of our vastness! Still, we do have room to grow. I often wonder how small countries, such as yours, manages with refugees and immigrants. As you say, conflicted. It was. But after buying the book, I decided to just take photos to have a blog post! 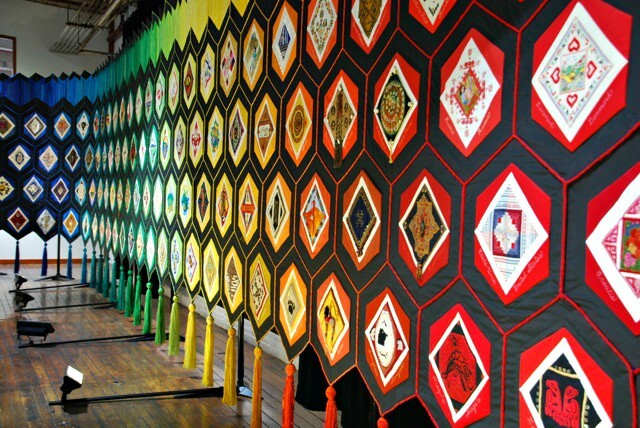 Now that is a quilt! Gorgeous! And it has travelled well!